Alain Touwaide, historian of botany, medicine, and medicinal plants, explores related topics in this popular seminar series. For its 2019 season, the series addresses a single theme—Reading Herbals—in four monthly classes. Sessions focus on botanical texts from the Near East and ancient Greece, the Mediterranean world, Byzantium and the Arabic world, and Europe in the Middle Ages and Renaissance. 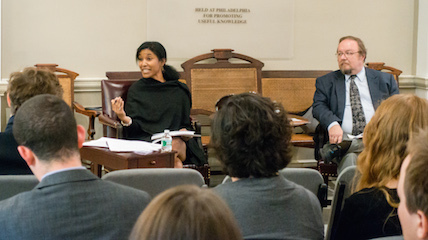 Carolyn Roberts of Harvard University, 2015-16 Consortium Dissertation Fellow, discussing a chapter of her dissertation at the American Philosophical Society in a seminar of the McNeil Center for Early American Studies, moderated by the Director of the McNeil Center, Daniel K. Richter. Philadelphia, October 2015. Joanna Radin, Department of History, Yale University, "Rescaling Colonial Life From the Indigenous to the Alien: The Late 20th Century Search for Human Biological Futures"